If you are planning on installing a wind turbine generator then it is essential understand the wind at your location. Obviously it is best to use an anemometer at the exact position you intend to locate your wind turbine, however there are a few useful online resources to get you started. First of all is the excellent GB Wind Map which provides current and forecast wind speeds for hundreds of locations across the UK. Forecast data is available for every three hour period for seven days. 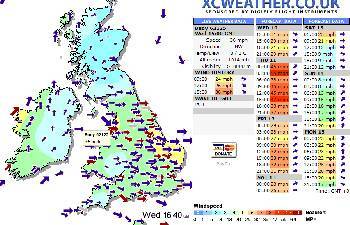 An alternative is the UK Wind Speed Database provided by the DTI. For this you need to convert your post code into a six digit grid reference using the following converter. The Ordnance Survey grid reference number (labelled LR) which is returned looks like this example for the post code GL50 1TA: SO948217. Remove the third and sixth digit (underlined) and that is the grid reference you need: in this example SO9421. Enter that reference in the DTI database and your average wind speed results will be output for heights above ground level of 10m, 25m and 45m in metres per second.